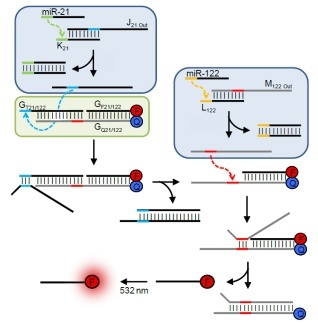 Specifically, we have generated a DNA based AND gate that responds to two microRNA input signals, miR-21 and miR-122, and entirely functions based on oligonucleotide strand displacement reactions. Only when both miRNAs are present will a quencher molecule be released from the gate, leading to fluorophore activation and miRNA detection. We have shown, for the first time, that these DNA logic gates are functional in human cells and thus opened opportunities for the development of fundamentally new, smart therapeutic agents. The DNA computational circuitry would first diagnose the presence of a specific miRNA expression pattern and then respond with the appropriate treatment.